...index, the fund only invests in nonfinancial stocks listed on NASDAQ, and effectively ignores other sectors too, causing it to skew massively away from a broad-based large-cap portfolio. QQQ has huge tech exposure, but it is not a 'tech fund' in the pure sense either. The fund's arcane weighting rules further distance it from anything close to plain vanilla large-cap or pure-play tech coverage. The ETF is much more concentrated in its top holdings and is more volatile than a vanilla large-cap benchmark. Still, it is extremely large and liquid, and has huge name recognition for the underlying index, the NASDAQ-100. In all, QQQ delivers a quirky but wildly popular mash-up of tech, growth and large-cap exposure. In the chart above one can trace the performance of the QQQ and a possible Timing-Instruments-Strategy, IF (!) 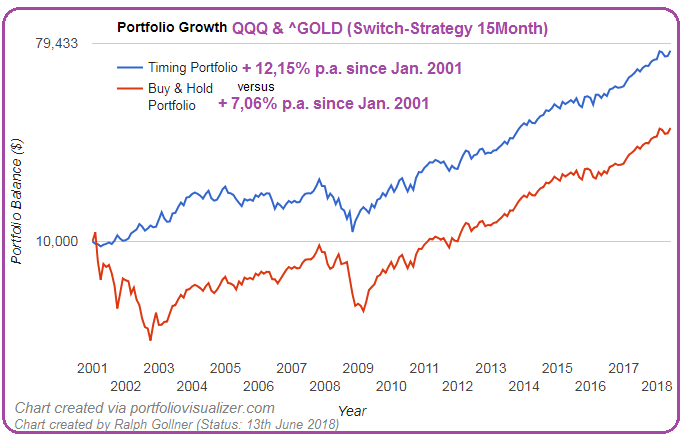 a timing-algorithm is applied, where the investment in the QQQ is replaced by a GOLD-investment; AND if certain downturns occur in the monthly development of the QQQ-equity curve.